Bob Avakian (BA) is the architect of a whole new framework of human emancipation, the new synthesis of communism, which is popularly referred to as the “new communism.” The goal of the new communism is a total revolution—the most radical revolution in human history that aims at nothing less than overcoming all forms of oppression and exploitation all over the world, a society where humanity could truly flourish. The new synthesis is based on more than 40 years of revolutionary work that BA has done critically analyzing and drawing from past revolutionary experience and theory, and a broad range of human activity and thought. It is a continuation of, but also represents a qualitative leap beyond, and in some important ways a break with, communist theory as it had been previously developed. It provides the basis—the science, the strategy, and the leadership—for an actual revolution and a radically new society on the road to real emancipation. The new synthesis of communism is a theoretical framework for a whole new stage of communist revolution, not just in this country but in the world as a whole. Fundamental and essential to this new synthesis of communism is its emphasis on applying a thoroughly and consistently scientific method and approach to understanding the dynamics of society and to charting pathways for its revolutionary transformation. By breaking with aspects of communism that have run counter to its scientific method and approach, Bob Avakian has qualitatively advanced communism as a science. The new synthesis of communism covers a vast scope of major issues: philosophical/epistemological; internationalism and an internationalist approach to revolution; important analysis, strategy and policies in relation to making revolution; and how to build a socialist society as a transition to a communist world. This summary cannot speak to all the elements of the new synthesis, but will provide some historical context for the new synthesis of communism and speak to what is most fundamental in the new synthesis. See the section “Key Works” for a listing of a few key reference works that are essential to understanding the new synthesis of communism. The first wave of socialist revolutions and societies began with the short-lived Paris Commune of 1871, the first attempt to overthrow and replace bourgeois rule. It took a leap with the October Revolution in Russia in 1917, and went further and took yet another leap with the Chinese revolution of 1949, in particular the Cultural Revolution of 1966-1976. This first wave came to an end in 1976 with the overthrow of proletarian power and restoration of capitalist rule in China. This first wave of socialist societies in the Soviet Union (1917-1956) and China (1949-1976) constituted an unprecedented and inspiring breakthrough in liberation for humanity. At the same time, and not surprisingly, this first wave was secondarily marked by shortcomings and mistakes; and while not the cause of capitalist restoration in the Soviet Union and China, these shortcomings did nonetheless play a role in the defeats of these revolutions. With the end of this first stage, communists have been confronted with the objective responsibility of scientifically summing up the lessons and legacy of these revolutions and the rich experience of exercising state power towards the transition to communism, in order to forge the theoretical framework for going forward. Bob Avakian, Chairman of the Revolutionary Communist Party, USA, has risen to that challenge and in the process qualitatively advanced communist theory. He has developed a theoretical framework for the new stage of communist revolutions, a new synthesis. A hallmark of the new synthesis is that, compared to any previous theoretical development of the science of communism, it is much more thoroughly and consistently scientific in its method and approach to everything. It puts a lot of emphasis on critical thinking and on really boldly confronting errors and shortcomings, while not denying or throwing away the actual successes and accomplishments of previous incarnations of the socialist revolution…. It gets back to what we were talking about in terms of truth and the understanding of what truth is. What is true is what actually corresponds to material reality. That’s what truth is. It’s not just an idea, it’s not just what you might think or what I might think. Does something correspond to the way things actually are in material reality, or does it not? What does the evidence show? You often have to be willing to dig, to explore more deeply, to uncover the evidence and get at the patterns. You generally can’t just answer a question like that in two seconds. You have to be willing to look for patterns and concrete evidence that actually exist in reality. You also have to look for evidence over a period of time: you want to examine repeated examples, not just one example. You don’t just want to go on very partial or limited experience, you don’t just want to say, Oh, well, this happened the other day, so obviously that’s truth, or obviously that’s a significant thing. Well, I don’t know. Is it part of a recurrent pattern, or is it just something that occurs every now and then? I mean, what is the actual significance? You have to dig more deeply to get at the bigger lessons of life and the bigger patterns of reality. And one of the things that Avakian has done is to actually promote that kind of method. He basically tells people, Look, no matter how much you might want a better world and no matter how much you might want revolution, and you might want communism, you just can’t try to twist things to fit your expectations or come out the way you’d like them to. You have to actually look for the truth of things, based on concrete evidence, even if it turns out to be an uncomfortable or inconvenient truth, and even if ends up revealing your own errors or shortcomings. If you really want to go in the right direction, you have to be able to face up to that…. To put this in a concentrated way, what is embodied in this new synthesis is a further revolution in human thought—a further revolution which proceeds from the fundamental scientific basis of communism, since its founding by Marx (together with Engels), and is, in an overall sense, within the same fundamental framework, but at the same time involves a qualitative leap in the development of communism. Of course, as I have stressed many times, there will remain the ongoing need, as there is with all sciences, to continue to learn more and further develop communism, through the dialectical back-and-forth between work in the theoretical realm and further developments in the world, including the development of a revolutionary struggle whose ultimate aim is a communist world. But what is crucial to grasp at this point is the reality that the new synthesis represents and embodies a qualitative resolution of a critical contradiction that has existed within communism in its development up to this point, between its fundamentally scientific method and approach, and aspects of communism which have run counter to this. This new synthesis has, most decisively, established communism on a firmer and more consistent scientific basis. This scientific method and approach is key to the breakthroughs of the new synthesis which include: deepening the understanding of internationalism; developing new insights into the strategic approach to revolution, which reveal the actual possibility of making revolution, even in a country like the U.S.; and re-envisioning how to go forward in the struggle to create a radically new—and truly emancipatory—society. The relationship between solid core, and lots of elasticity on the basis of that solid core, is a hallmark of the whole new synthesis. There are a number of dimensions to this and this biography will touch on some basics. As the new synthesis brought forward by Bob Avakian has given emphasis to, the process of making revolution, and then continuing the revolution in the new socialist state toward the final goal of communism, must involve the active participation of broad ranks of the people, of different strata, and will proceed through many different “channels,” involving many diverse forces among the people in many different spheres of human endeavor, not only those more directly political or relating more directly, at any given time, to the functioning and objectives of the leadership of the revolution and the new socialist state; and the orientation and aim, consciously taken up by growing numbers of the people, must be to work so as to enable all this to contribute, in the final analysis, to the struggle to further transform society in the direction of communism. In keeping with this orientation and these objectives, the principle of “solid core, with a lot of elasticity” must be applied. This means that, on the one hand, there must be a continually expanding force in society, with the revolutionary communist party as its leading element, which is firmly convinced of the need to advance to communism and deeply committed to carrying forward this struggle, through all the difficulties and obstacles; and, on the basis of and at the same time as continually strengthening this “solid core,” there must be provision and scope for a wide diversity of thinking and activity, among people throughout society, “going off in many different directions,” grappling and experimenting with many diverse ideas and programs and fields of endeavor—and once again all this must be “embraced” by the vanguard party and the “solid core” in an overall sense and enabled to contribute, through many divergent paths, to the advance along a broad road toward the goal of communism. This orientation and approach is embodied in the Constitution for the New Socialist Republic in North America. The real reason that you need to build in and allow for some genuine elasticity, on the basis of the solid core, is because society needs it, the process needs it. The revolutionary process itself needs to breathe, the revolutionary society needs to breathe, or it won’t be any good. Both the process of getting to the revolutionary seizure of power, and then the process of building the new society needs to breathe. And if you try to control it all too tightly and too rigidly—even if you happen to be right in what you’re doing at any given time, if you’re too tight and controlling, it’s just going to be discouraging and demoralizing to people, and people are not going to be given the scientific tools to figure it out enough themselves, and you’re going to end up with a repressive society, a rigid society and a rigid process. And Bob Avakian really understands that, because he’s a good enough scientist to understand the material tension that exists, objectively, between what’s called the solid core, the certitude, the elements that you can actually be confident of, in terms of what’s wrong with the current society and what’s needed in a future society to benefit humanity, while at the same time understanding the need to sort of shepherd the process in such a way that it can encompass and incorporate the widest possible diversity of views and approaches from among the different strata of the masses in society. 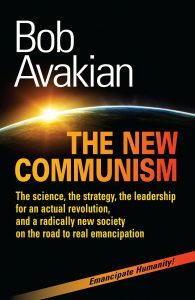 Avakian has extensively addressed the question of proletarian internationalism, advancing an understanding that the proletarian world revolution must be viewed as a single integrated world process in which the international arena is overall principal; that socialism in a particular country must in the first place be built as a base area for the world revolution; and that in their approach to revolution, communists must proceed from an understanding of what will advance revolution on a world scale. Avakian contends that as long as capitalist-imperialist relations of exploitation and production and an oppressive capitalist state still have a foothold in the world, there is the basis for these relations to recreate themselves and spread elsewhere; and that in fact, it is quite likely that socialism in particular countries is bound to be reversed unless further advances are made in the world proletarian revolution. Further, Avakian argues that in an ultimate and overall sense, the development of a revolutionary situation in a particular country is more determined by developments in the world as a whole than by developments in that country—and emphasizes that this understanding must be incorporated into the approach to revolution, in particular countries as well as on a world scale. One of the things you get from Bob Avakian which I really appreciate is that he’s promoted this concept that we need “emancipators of humanity” and that we need to move in the direction of making this world, this entire planet, a good place to live in and function for all of humanity, where we can get away from the idea that some groups of people, and some categories of people, or some whole countries, are lording it over others, and exploiting and dominating and oppressing others. That’s the whole idea of this revolutionary communism, and one of the things you really get from BA is the need to always think and proceed back from the need to emancipate all of humanity. [This Constitution] sets forth a basic model, and fundamental principles and guidelines, for the nature and functioning of a vastly different society and government than now exists: the New Socialist Republic in North America, a socialist state which would embody, institutionalize and promote radically different relations and values among people; a socialist state whose final and fundamental aim would be to achieve, together with the revolutionary struggle throughout the world, the emancipation of humanity as a whole and the opening of a whole new epoch in human history—communism—with the final abolition of all exploitative and oppressive relations among human beings and the destructive antagonistic conflicts to which these relations give rise. But one of the things that needs to be understood more, and BA is very much a proponent of this, is that people need much more, the oppressed need much more, than just the material requirements of life narrowly defined. They also need science and art and culture, they need expansive atmospheres, they need room to breathe, they need room for dissent and ferment, they need room to think, they need room to do nothing [laughs]. It’s a much more lively and broad understanding of what it means to correctly identify what are the objective needs of the people, even the people who are the most oppressed. Yes, they need food and health care and shelter, but they need a lot more than that. And in the past experience of the communist revolution, that hasn’t always been understood well enough…. It needs to meet basic economic needs, but it also has to meet the cultural needs, the scientific and artistic needs, of people broadly and in all their diversity. It obviously needs to be able to encompass and meet the needs of the most oppressed and exploited, but it needs to do even more than that. It needs to encompass very broad swaths of humanity, in all its variations and diversity. After the loss of socialism in China, BA stood out among communists worldwide for his work developing a thorough and scientific analysis of what had happened in China and why capitalism had been restored there. Over decades of theoretical study and analysis, BA forged a deeper and new understanding of the process needed to advance revolution to socialism with the final goal of communism. But all of this has been and continues to be very contested in the world today. The basic premise that communism is a science has historically been a major point of contention with liberal thinkers such as Karl Popper, and with communists in the international communist movement, and for a long time, even within the RCP. In the international communist movement, there are those who argue that the previous socialist experiences have principally been flawed and that consequently it is necessary to revert back to variations on the principles of the bourgeois-democratic revolutions; and on the flip side of this, there are those who argue it is in essence “heresy” to critically evaluate and recast and re-envision the road to socialism and communism—a position which ends up reducing communism to a dead and ossified dogma. BA has polemicized against both of these trends and has developed and put forward the new synthesis of communism as the theoretical framework for the advance of the communist movement.